ఏప్రిల్ 16 నాడు జరిగిన ఎన్నికల్లో పోటీ చేసిన పోలేపల్లి సెజ్ బాధితులు మహబూబ్ నగర్ జిల్లాలోని కొన్ని అసెంబ్లీ స్థానాల్లో గెలుపోటముల్ని నిర్దేశించే అవకాశం ఉందని “సూర్య” దినపత్రిక మే 9 నాడు ఒక కథనం రాసింది. POLEPALLY (Mahabubnagar Dt): Victims of Polepally Special Economic Zone whose lands were acquired at low prices for setting up a pharmaceutical SEZ in Jadcherla constituency of Mahbubnagar district are planning to go to New Delhi on the day the new government is be sworn in. The victims already drew national attention by fielding 15 among them as independent candidates for Mahabubnagar Lok Sabha seat, making it probably the only constituency with so many independents in the first phase. And, they want to make the new Prime Minister realise their plight and ‘do something to remedy the loss incurred with no fault of theirs’. The 350-odd families voted en masse for their candidates but, casting 2,400 votes on the electronic voting machines was not an easy affair for villagers, mostly illiterate. Troubled as they were to identify their candidates’ names in the EVMs, the victims were, however, committed to continue their struggle as assurances given to them like permanent jobs and house sites are hard to come by. “It is not just our vote. People from neighbouring villages also voted for us and this vote is all set to tilt the balance,” G. Ravindra Goud, one of the contestants said. What about the choice of the villagers as the election was held simultaneously to Jadcherla Assembly segment? “They may have different affiliations, but our people we firmly believe have not voted for the party which created so much of trouble for us,” B. Lakshmamma and Rangavva, two other candidates said hinting at the trouble in store for Congress candidate Mallu Ravi in the fray. జడ్చర్ల గ్రామీణం, న్యూస్‌టుడే: ‘నేను పోలేపల్లి పీనుగను మాట్లాడుతున్నా’ పుస్తకాన్ని విప్లవ రచయితల సంఘం నాయకులు వరవరరావు ఆవిష్కరించారు. సోమవారం జడ్చర్ల మండలం పోలేపల్లిలో సెజ్‌ బాధిత రైతులతో కలిసి ఈ కార్యక్రమంలో పాల్గొన్నారు. ఇందులో పోలేపల్లి బాధితుల కథనాలు ఉన్నాయి. కార్యక్రమంలో గీతాంజలి తదితరులు పాల్గొన్నారు. అనంతరం మొదటిసారిగా పోలేపల్లిని సందర్శించిన వరవరరావు గ్రామంలో పర్యటించి బాధితులతో మాట్లాడారు. They are displaced farmers and they know that their chance of getting elected is very remote. Yet, they have entered the electoral fray. As many as 15 farmers of Polepally village in the backward Mahabubnagar district of Andhra Pradesh have filed their nomination for the Mahabubnagar Lok Sabha constituency as independent candidates for the coming general elections. Their purpose is to draw people’s attention to their plight and also of all others whose land have been acquired for setting up a Special Economic Zone. Of course, this is not for the first time that the unlettered and apolitical farmers are contesting the elections. They had done so in the by-elections held in May 2008. Thirteen of them contested for the Jadcherala assembly segment, which comprises Polepally. They together garnered over 13,500 votes and all of them forfeited their security deposits. They were, however, happy at the outcome as they could draw the attention of the people of the state to their prolonged struggle against the SEZ. This time, they want to draw the attention of the country. The farmers’ problems started in 2003, when the then Telugu Desam Party government identified 969 acres in Polepally and Mudureddypally villages for setting up the SEZ. In 2005, the Congress government enforced the proposal leading to displacement of around 350 small and marginal farmers. Nearly half the land acquired was assigned land belonging to dalits and tribals. According to farmers, their compensation ranged from Rs 18,000 to Rs 50,000 per acre depending on whether it was an assigned or patta land, while the market price stood at around Rs 20 lakh an acre. The farmers were against the SEZ from the beginning. In 2003, they blocked the Hyderabad-Bangalore national highway in protest against land acquisition. The next year, they staged a demonstration before the state Legislative Assembly. 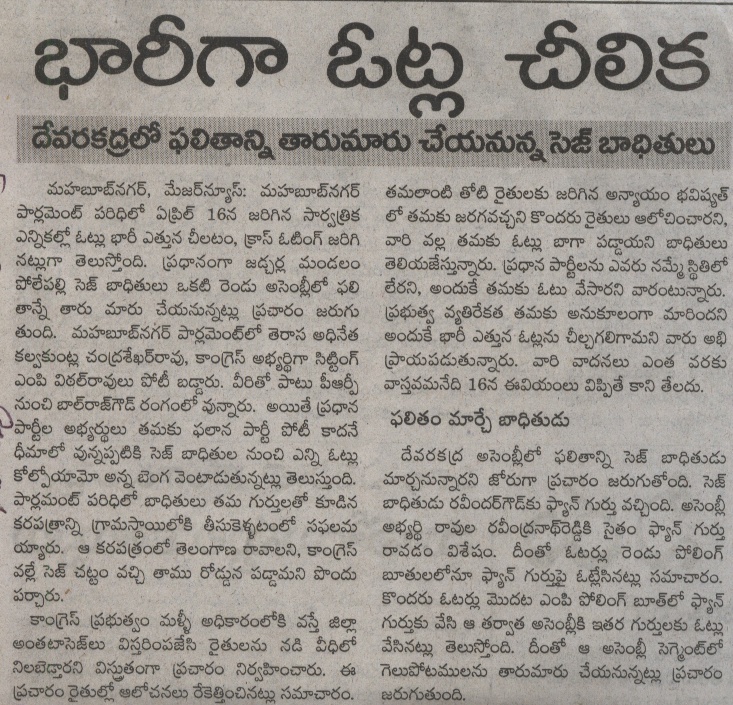 A Polepally SEZ Vyathireka Aikya Sanghatana (Alliance against Polepally SEZ) was formed and the struggle continued. Meanwhile, 200 acres in the SEZ have been earmarked for pharmaceutical companies, where Hyderabad-based Aurobindo Pharma Ltd and Hetero Drugs Ltd are setting up their facilities. 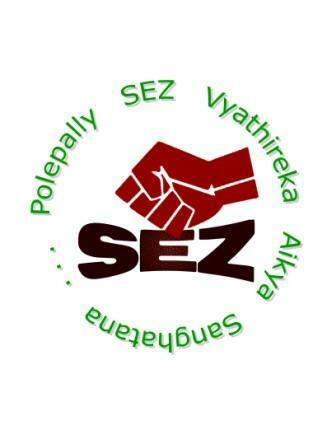 DETERMINED LOT: Displaced farmers of Polepally village are contesting the Lok Sabha polls to oppose the SEZ. POLEPALLY (MAHABUBNAGAR DT): They are all unlettered farmers who have never been active in politics even in their own village. But circumstances seemed to have willed otherwise for over 360 farmers’ families of this village in the backward Jadcharla Assembly constituency of the drought-prone Mahabubnagar district, known for migration of labourers on a large scale. Will SEZ candidates trip bigwigs in Mahbubnagar LS seat? They lost their land when the government decided to develop the Polepalli pharma special economic zone (SEZ). Now, 15 evacuees are contesting polls from Andhra Pradesh’s Mahbubnagar Lok Sabha seat. They are demanding that the land acquired by the government for the SEZ be returned to the people. The SEZ will come up at Jadcherla in Mahbubnagar district, about 80 km from Hyderabad. The 15 candidates — B. Lakshmamma, Mala Jangilamma, Sattemma, Rangamma, K. Kurmaiah, K. Narsimha, Y. Lingaiah, Chinna Venkaiah, G. Narasimha, M. Pandu, D. Sayanna, M. A. Jabbar, Ravinder Goud, Sinaiah Goud and V. Venkatesh — filed their nomination papers on Monday. Another candidate, G. T. Krishna, filed his papers for the Mahbubnagar assembly seat.